Following his production of THINGS OF DRY HOURS back in 2007, Raz Shaw makes a welcome return to the Royal Exchange to direct WIT, the Pulitzer prize-winning play about a 50 year old professor dying of cancer. 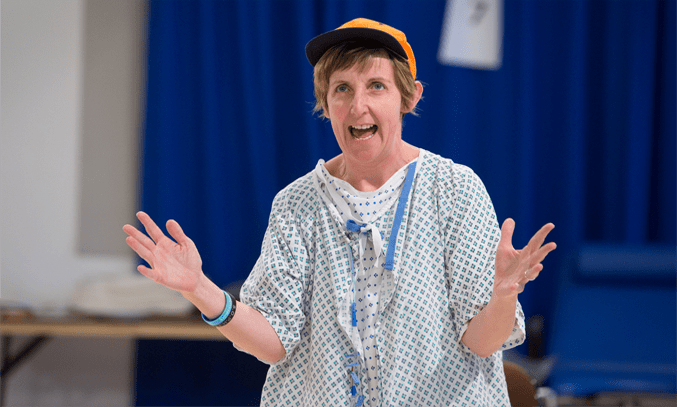 Written by American playwright Margaret Edson, WIT tells the story of Vivian Bearing (Julie Hesmondhalgh) a renowned academic of metaphysical poetry being treated for stage IV metastatic ovarian cancer. Confined to a hospital bed, Vivian reflects on her life through the intricacies of the English language, particularly the poetry of John Donne, as her body and mind endeavours to cope with the experimental and aggressive treatment. The one-act play won the Pulitzer Prize for Drama in 1999 and was adapted into an Emmy award-winning television film in 2001 starring Emma Thompson. Raw, real and relentless, Shaw’s adaptation of WIT is emotional, thought-provoking and deeply moving. Striking and sharply funny, every inch of this production is crisp, precise and emotionally penetrating, reflecting on the frailty of life and the complex relationship between knowledge and love. Slow motion is used to detach the main character from the otherwise chaotic and fast-paced environment of the hospital, with Shaw cleverly using light and sound effects to demonstrate the different types of tests Vivian must endure as part of her treatment. The subject of cancer is strikingly real to Shaw, who was diagnosed with stage 4 Non-Hodgkin’s Lymphoma at 28 years old and has since wrote a book Death and the Elephant: How Cancer Saved my Life about his experiences. His connection to the subject is apparent as the play’s themes unfold with elegance and economy, revealing a rich and resonant piece that will leave you both moved and shattered. Julie Hesmondhalgh (BLINDSIDED, CORONATION STREET) is flawless as the brilliant yet brittle Vivian Bearing. 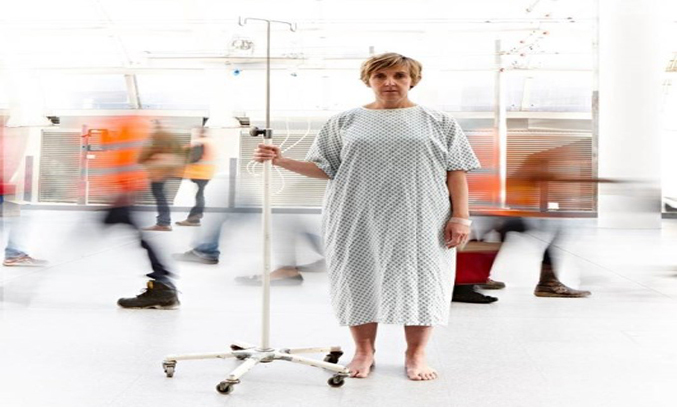 Looking like skin and bones in a hospital gown, Hesmondhalgh brings Edson’s beautiful story of grace and transformation to life with a performance that is both funny and devastating in equal measures. Vivian’s last hours are told like a living diary through a series of moving ‘flashbacks’ as she addresses the audience with bitingly honest monologues, poetry inserts and personal reflections, with Hesmondhalgh sparing no pain as she guides us through her last hours. Hesmondhalgh is supported by strong and understated work from the supporting cast, in particular Esh Alladi as Dr. Kelekian’s intern Dr. Jason Posner, a former student of Vivian and in many ways, her perfect counterpart. At the hospital, the doctors are only interested in Vivian for her research value and as a consequence, tend to ignore humanity in favor of knowledge. Determined to stay in control, Vivian approaches the aggressive illness with the same rationalism that has served her so well in her career but when it comes down to it, she eventually realises she would prefer kindness to intellectualism. The only person who shows her any compassion is nurse Susie Monahan, played by fellow CORONATION STREET star Jenny Platt who who sees her suffering and treats her with kindness. The penultimate scene were fellow teacher Dr. Ashford (Julie Legrand) comes to visit Vivian in the hospital, is also utterly heartbreaking and is sure to leave you with a tear in your eye. At its most simple, WIT is a play about life, love, sickness and death, something we all can relate to, but while it is undoubtedly a beautiful and moving piece, it also is incredibly tough to watch. For better or worse, the audience are bound to Vivian, suffering with her through the indignities and physical pain and there are times when you just want to avert your eyes because it’s just too painful to watch. That said, if you can cope with the grim reality of the piece, WIT is a beautiful play full of grace and redemption and an emotionally absorbing piece of theatre that redefines empathy and compassion.